One of the last challenges that I participated in for NSD was the #NSDrockstar challenge posted by Studio Calico. The gauntlet was thrown to incorporate all six of their challenges into one layout. 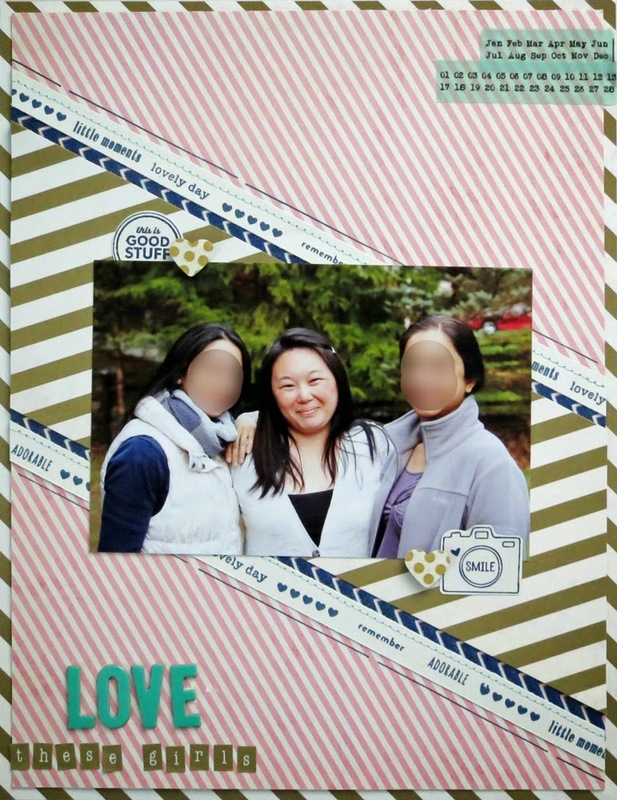 Since I've been short on time for scrapbooking lately, this was a fun way to play along, and with so much criteria needing to be met, I didn't have to make very many decisions. There was a color scheme of pink, aqua, navy, and gold to use and one of three sketches to choose from. You needed to use a new stamp, as well as making a pattern paper using stamps. You also needed to use washi tape in three different ways, and use scraps from any projects from challenges you completed. I wound up with quite a different layout than what I would have normally created, but not only did I enjoy the challenge, I used quite a few supplies in new ways. I'm hoping to get some more layouts created this weekend and hope you have a wonderful weekend, crafting or otherwise! Beautiful color scheme and great mix of patterns, Elise! Love the diagonal design! Very beautiful, love the color palette and the design. Great page! I really like the diagonal design. Love the design Elise, glad you got time to scrap and had fun! great page! love the angle! Great job with the challenge! I was way too overwhelmed by NSD to play along at all, lol. I love the diagonal design mounted on top of the diagonal background paper. Fun! I love the colours and how you worked in so many challenges in one layout.